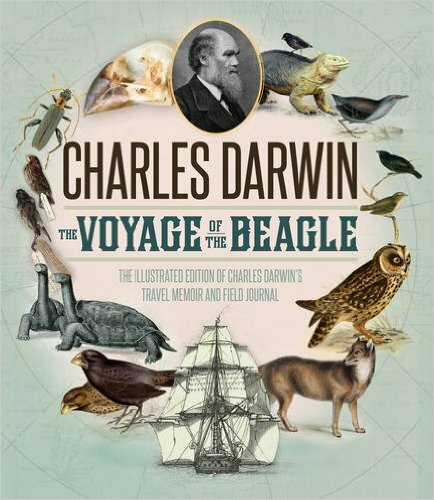 Welcome to the 52 Books voyage aboard the HMS Beagle with Charles Darwin and company. Rose will be our Captain and guide for this trip. Charles Darwin: his name evokes as broad a range of responses as any figure in modern times. I’ve seen descriptions and characterizations of his life, his work, and his intentions in publishing it that seem like they can’t possibly all be about the same person. How can you get a handle on the real Darwin? Who was he, what motivated him, what did he feel about the development of the theory of evolution, and what did he believe its legacy would be? 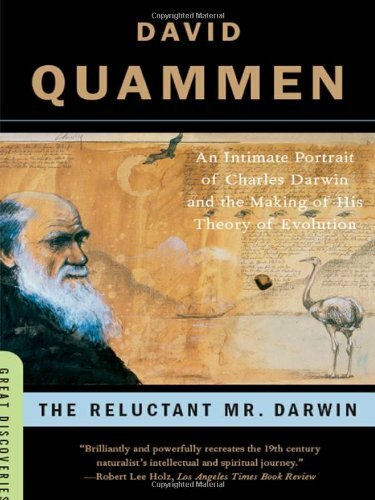 I’m going to suggest three books that will help an interested reader get a handle on the real Charles Darwin. These books don’t specifically focus on the theory of evolution, but on the man behind the theory. First: to understand the man, read his own words. Start with The Voyage of the Beagle: May I recommend this lovely illustrated edition? It is slightly abridged, but it is also enriched with maps, photographs, line drawings, botanical illustrations, portraits, and very interesting excerpts from Robert Fitzroy’s Proceedings of the Second Expedition, the book he published about the expedition. This is the book I'll be reading this month, and I look forward to discussing it with anyone who'd like to join me! It’s fascinating to consider what his education must have been like, what kind of mental preparation and training he had in order to be able to observe, catalog, and think about all the things he saw on his remarkable voyage. Though we may have much more information at our fingertips today than Darwin could dream of, I imagine that few of us would consider ourselves as knowledgeable as he was – and at a remarkably young age: He was just 22 when the Voyage began. This amazing voyage, and the thousands of observations and drawings he made and specimens that he collected gave him the raw material he needed to formulate his theory. Ok, but how did Darwin get from The Voyage to The Origin of Species? 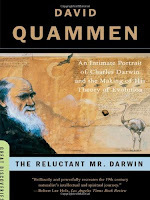 The Reluctant Mr. Darwin: An Intimate Portrait of Charles Darwin and the Making of his Theory of Evolution by David Quammen (a wonderful science writer! I’ve enjoyed everything I’ve read by him) is, well, a fascinating and intimate portrait of Darwin’s life and work in the years between his return to England in 1836 and the publication of his paper on Evolution in 1859 – a remarkable 23 year lag which would certainly have been even longer had Alfred Russell Wallace, a young naturalist who had traveled to South America and Southeast Asia and who had independently developed the idea of evolution by natural selection, not sent Darwin his own manuscript to review. Darwin saw with horror that this manuscript articulated many of the ideas he’d been developing, but sitting on, for so many years, and this prompted him to finally share his theory with world – ready or not. Why did Darwin wait so long to publish his theory? 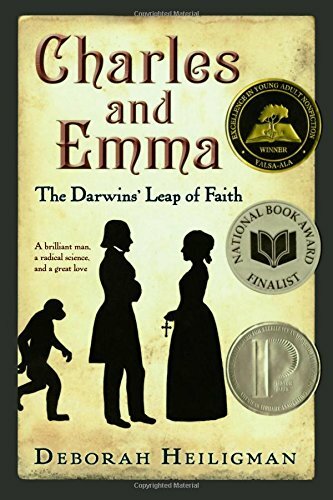 Quammen’s discussion is enlightening, but for an even more intimate portrait from a different perspective, read Charles and Emma: The Darwin’s Leap of Faith by Deborah Heiligman. 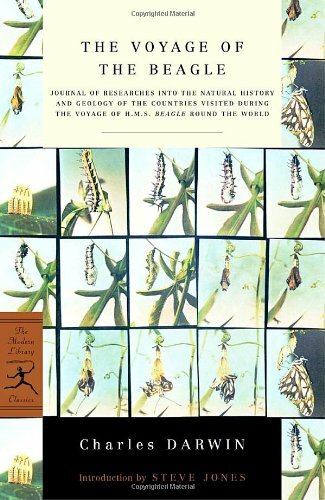 This was a lovely book that introduced me to a woman I now deeply admire: Emma Darwin. As much a biography of Emma as of Charles and their life together, I was fascinated to read about Emma’s quite liberal and open upbringing and education. The Darwin’s were cousins, and knew each other all their lives. They were aware of their compatabilities, and a marriage between them was natural and expected, but they were also aware of a potential incompatibility: Emma was a woman of deep faith, strengthened after the death of a beloved older sister, while Charles lived with doubt about the existence and the nature of God, and wrestled with the problem of evil his whole life, especially after the tragic deaths of several of his children. But the Darwin’s made the “leap of faith” and formed a unique and amazing partnership. Darwin’s reluctance to publish his theory was partly due to his own nature, his perfectionism, and his desire to present an unassailable case, but it also stemmed from a reluctance to cause pain to his wife. He didn’t think her faith would be challenged, but he did worry that she would be pained by attacks on him. I think it’s safe to say Darwin wouldn’t have been the man he was without Emma at his side. She was his first reader and critic, and the example of how they conversed, with respect and love, about their theological differences was inspiring. I loved reading about their home, their children, their parenting philosophies. And I loved reading about Emma and her life after Charles. I can remember just where I was as I listened to the end of this book: driving, tears streaming down my cheeks, thinking that in Emma, I had a role model I’d love to live up to. 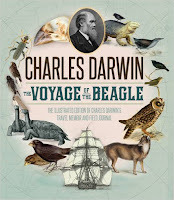 I hope some of you will be inspired to read or listen to either of these Darwin biographies, and I hope you will join me on a read-along of The Voyage of the Beagle this month. I hope to tackle The Origin of Species at some point in the future, but first things first! I found The Voyage of the Beagle at Project Gutenberg to read online. Thanks for hosting the challenge! I'm going to work my way through leaving comments on the other blogs to post a comment between each entry of mine. Just seems fair.